28 May 2009 – San Fabian. The Barangay Evangelization Program, or the Visitation, was held in Brgy. Gumot last Thurday, 28 May. Team Three of the Adult Formation Program gave the one-day seminar. The seminar has three main topics: Family Life (including a discussion on the Natural Family Planning Method), Basic Doctrines of the Church and the Bible. Team 2 is composed of Bro. Leopoldo Manalo and his wife, Sis. Marlene Manalo, Sis. Ma. Rowena Nicer, Sis. Leonora Datuin, Sis. Elizabeth Terte and Sis. Shirley Tersol. Every week, a different team gives the seminar. There are three teams formed by the parish. Bro. Estephen R. Espinoza was on hand to support Team 2 in holding the seminar. To see more pictures of the Brgy. Gumot Visitation, please click HERE. 27 May 2009. San Fabian - Several members of the Ministry of Altar Servers, together with Bro. Estephen Espinoza, went on a potluck outing on Wednesday, 27 May, in Boating World Resort at the San Fabian beachfront. A whole day of fun and laughter was shared among those who were able to join the outing, spending the day swimming, boating, and videoke-singing on such hot, sunny day. The Ministry of Altar Servers is composed of girls and boys who come from the different private and public schools of San Fabian. Girl-altar servers joined the ministry only last 2004. Before this, the altar servers were only boys. The altar servers do not only serve in all the masses of the parish but also join other liturgical celebrations such as processions and stations of the cross and the like. The whole-day outing for the altar servers began at eight in the morning and lasted until six in the evening with the sacristans asking for a bit more time to soak in the water. Everyone went home with sun-kissed skin and with smiles gleaming like the playful waves of the beach. The parish is calling on young girls and boys to join the ministry. He/she must have already received first communion. Meeting is scheduled every Saturday at 2:00 PM in the Parish Church. To see more pictures of the exciting outing of the sacristans, please click HERE. 23 May 2009. San Fabian. The Barangay Evangelization Program or the Visitation was held in Makukuli, Brgy. Inmalog Norte. The images of the Divine Mercy and the Blessed Virgin Mary stayed for one week in the chapel of Makukuli (literally, it means “industrious”). The program elements were held during the week with the Adult Formation held on 20 May, Wednesday. Bro. Dado Vallejos and Bro. Tony Supremido talked on “Family Life and Responsible Parenthood”. Included in the talk was the discussion on the Natural Family Planning Method. Bro. Tony discussed with the group the next day about the “Signs and Symbols.” Youth Encounter (YE) was also held facilitated by the Parish Youth Apostolate Committee. It was held from May 21-23, 2009. On May 23, Saturday, the Holy Mass was celebrated at around 2:20 in the afternoon after a brief Pre-Cana talk given to the parents and godparents of thirty-two children who were to receive the sacrament of baptism. Fr. Oliver E. Mendoza took the opportunity to share with the residents about the Message and Devotion of the Divine Mercy. The Sacrament of Baptism was celebrated after the mass. After a brief veneration of the images, the Divine Mercy and the Blessed Virgin Mary were then loaded in the truck of Bro. Bernie Solis and brought to Brgy. Gumot. Some residents of Makukuli, Bgry. Inmalog Norte, riding in a jeepney, accompanied the images until Bgry. Gumot. To see some pictures of the Visitation in Makukuli, Inmalog Norte, click HERE. To see more pictures on the Transfer of the images from Makukuli, Brgy. Inmalog Norte to Brgy. Gumot, click HERE. San Fabian. In a meeting by the members of the Parish Pastoral Council of the Parish of St. Fabian, Pope and Martyr, held last 20 May 2009, Wednesday at the Parish Rectory Hall, the PPC identified and resolved to finish the following projects, in line with the Vicariate III celebration of the solemnity of Christ the King in which the parish is the host: the repair of the Parish Rectory Roof and the construction of a covered pathway which will link the parish church, the parish center and the Mt. Carmel Chapel. The parish rectory was destroyed during the bombings by the American forces in the battle to liberate the Philippines from the Japanese forces. In a short article about the history of the Parish of St. Fabian, Msgr. Rafael S. Magno, Jr, a f ormer parish priest of San Fabian, wrote: “The naval bombardments during the American-Japanese war for liberation in the early days of January 1945 significantly damaged the church and practically destroyed the convent; the bell tower crumbled in ruins.” (click here for the full article). In 2003, after almost 58 years after the destruction of the belfry in 1945, the bell tower was fully restored. The restoration of the belfry was the project decided upon by the PPC when the Parish of St. Fabian hosted the Vicariate III celebration of Christ the King in 2003. The PPC would like to continue the full restoration of the church and the convent with the repair of the convent roof as it hosts once again the vicariate celebration of Christ the King. The convent roof had been in disrepair for a while. After its destruction in 1945, the convent was repaired. But the roof that was in place was not in the design and structure before it was destroyed by the bombs. In 2008, during the onslaught of Typhoon Cosme, the convent roof was blown away by the strong winds. Hopefully, when the PPC undertakes the repair of the roof, its original design will be restored. Engr. Santiago Alhambra together with his committee members will supervise the repair of the convent roof. Since 1955, Engr. Santiago Alhambra, one of the parish lay leaders, does much of the planning and the supervision work of the parish projects. Inmebat si Jesus, “Saray panaon tan agew ya inggetar na Ama, diad pakayari ton dili, et ag la nakaukolan ya amtaen yo ra. Balet naitdan kayoy pakayari no onsabid sikayoy Ispiritu Santo, tan magmaliw kayon tasik ed Jerusalem, diad intiron Judea tan Samaria, tan diad amin a sokung na mundo.” Kapangibaga to ya, niatagey ed tawen leleg dan neneng-nengen, insan asaniban na lorem. E/. ONSESEGEP SO DIOS ED TRONO TO; WALAY TANUL NA SARAY TRUMPITA A PARA KATAWAN. 1. Mantipak kayod liket, amin yon katoowan! Idayew yoy Dios diad panamegley na maksil iran kanta! Nepeg a takotan so Katawan a Sankatageyan; matalonggaring ya ari a manooley ed sankamundoan. E.
2. Onsesegep so Dios ed trono to. Wala ray maliket ya eyag tan tanul da ray trumpita leleg ya onsesegep so Katawan. Kantaan yoy pangidayew so Dios; kantaan yoy pangidayew so ari tayo! E.
3. Say Dios so arid sankamundoan; kantaan yo na pangidayew. Manyodyorung so Dios ed masanton trono to; manooley ed saray bansa. E.
Kekerewen kod mapagalang tan makapanyarin Ama a Dios na Katawan tin Jesu-Cristo, ya itdan to kayo komuy Ispiritu. Sikatoy mangiter ed sikayoy kakabatan, tan ipaamta tod sikayoy Dios, pian nakabatan yo. Ipipikasik a naliwawaan komuy kanunotan yo pian naamtaan yo no antoy ilalon impanawagan tod sikayo, no panoy kayaman na makapakelaw iran bindision ya insipan ton ipatawir ed saray totoo to, tan no panoy ontan lan kabiskeg na pakayari ton mankikimey ed sikatayo ran mananisia. Sayan pakayarid sikatayo et kapara to may pakayariy biskeg na Dios ya impamaoli tod bilay ed Cristo, tan impamayorung tod sikato ed nikawanay Dios diad katawenan. Si Cristo manarid man ed amin da ray mangatatawen a manoley, saray walay betang, saray walad pakayari, tan anggan saray kakatawan; walad silong na pakayari na pakayari toy amin a mambebembey betang diad sayan mundo tan anggan diad arapen. Say Dios pinasuko toy amin a bengatla ed Cristo, a sikatoy inter tod iglisia a sankatageyan a panguloy amin a bengatla. Say laman nen Cristo et say iglisia, say inkagnapan na mangiiter na inkagnap na amiamin a bengatla. E. Alleluia. Laka yo tan ibangat yoy ibanghilyok ed amin a totoo; kaiba ta kayo lawas, anggad pansamput na mundo. E. Alleluia. Inkuanen Jesus ed saray labinsakey a disipulo, "Laka yod intiron mundo tan ipulong yoy Maung a Balita ed amin a pinalsa. Siopamay manisia tan nabinyagan, nilaban; siopamay ag manisia, nadusa. Saray mananisia naitdan ira na saray tanda na pakayari: papawayen da ray dimonyo ed ngaran ko; mansalita ray nandoroman salita; no mamemben iray oleg tan no oninom iray samal anggapoy maoges a nagawad sikara; tan onabig iray mansasakit a pangitapewan da ray lima ra." Kasumpal ya akisalitay Katawan a Jesus ed sikara, niatagey ed tawen tan inmirung ed nikawanan na Dios. Linma sirin a nampupulong ed amin a pasen iray disipulo. Tinulongan iray Katawan ed sayan kimey da. Initdan to ray pakayari a manggaway milagro a pamaneknek ton katwaan so salita ya impupulong da. Padre:Nen say inmolin Katawan tayo et tinmokotok ed tawen, saray angeles impanunot dad saray disipulos to ya sikato et ompawil dia lamet. Anggad satan ya ipawil to, ituloy tayoy kimey to diad pangipikasi tayod amin a totoo tan saray nakaukulan da. Say ebat tayo: KATAWAN, DENGEL MO PAY PIKAKASI MI. Padre: Dios ya Ama min walad tawen, say Anak mo manyodyorong natan ed kawanan mo ya napnoy andi-anggaan ya gloria. Diad panamegley to, isaklang mi rayan pikakasi mi ta sikatoy manari ed ando lan ando. Amen. San Fabian. Sitio Makukuli of Brgy. Inmalog Norte received the images of the Divine Mercy and the Blessed Virgin Mary on Saturday, 16 Mary 2009 from Brgy. Inmalog Sur. The images were transported using the truck of Bro. Bernie Solis. The images were accompanied from Brgy. Inmalog Sur to Brgy. Makukuli by representatives of Brgy. Makukuli, Inmalog Norte. Along the way, the Parish Jeep suffered a flat tire. Fr. Oliver E. Mendoza and some parishioners were on board the jeep. On the way back, the truck also suffered a flat tire. The images will stay in Makukuli, Inmalog Norte from 16 May to 23 May 2009. The Adult Formation Program will start at 3 o’clock in the afternoon of Wednesday, Thursday and Friday. To see more pictures of the transfer of the images from Inmalog Sur to Inmalog Norte, click here. The following Teams of Lecturers were formed to give the sharings and talks on "The Serving Church (Family and Life)", "The Teaching Church (Doctrines, Signs and Symbols)" and "The Praying Church (The Bible)". The overall coordinator of the teams of lecturers is Bro. Estephen R. Espinoza. San Fabian. The evangelization program of the parish was held in Brgy. Cosait, Inmalog Sur. The images of the Blessed Virgin Mary and the Divine Mercy were welcomed by the residents of Cosait on 9 May 2009, after coming from Brgy. Bolaoen. The visitation coincided with the fiesta of the barangay. A procession of the Blessed Virgin Mary was held last 13 May, which was significantly the Feast of Our Lady of Fatima. The procession passed through the different sitios and purok of Inmalog Sur. The Adult Formation program was held in the afternoon of 13 May, Wednesday and the succeeding days. The talks began at 3 o'clock in the afternoon. The first talk was given by Bro. Dado Vallejos on the family, as well as an explanation of the Natural Family Planning Method. Bros. Estephen Espinoza and Randolph Romero gave the talks on "The Teaching Church" and the "Praying Church" on 14 May (Thursday) and 15 May (Friday) respectively. On 16 May, Saturday, a Holy Mass was celebrated at 3 o'clock in the afternoon. The images were transferred from the Brgy. Chapel in Cosait to the Inmalog Sur Integrated School which could accommodate more people. Bro. Tony Supremido gave the Pre-Cana lecture to the parents and godparents of the children to be baptized. A confession of the Youth Encounter (YE) participants was heard by Fr. Oliver E. Mendoza, the parish priest. The Youth Encounter seminar was facilitated by the members of the Parish Youth Apostolate Committee. The YE began on Thursday afternoon and ended in the afternoon of Saturday. A couple received the Sacrament of Matrimony. The celebration of the sacrament of marriage for those couple who are civilly married is one of the elements of the barangay evangelization program of the parish. The images of the Blessed Virgin Mary and the Divine Mercy were then received by Brgy. Makukuli, Inmalog Norte. 9 May – San Fabian. The Barangay Visitation of the images of the Divine Mercy and the Blessed Virgin Mary held its last day in Brgy. Bolaoen last 9 May, Saturday. The culminating activities began at 9:00 AM with the praying of the Holy Rosary and the Chaplet of the Divine Mercy. Bro. Tony prepared the community in the celebration of the Sacrament of Baptism with a brief catechism on the sacrament of baptism. The Visitation in Brgy. Bolaoen, as in all succeeding Barangay Visitations, lasted for a week. A catechism on Family and Life, on Responsible Parenthood, was given to the adult members of the community last 6 May, Wednesday. This was given by Bro. Diosdado Vallejos, the Parish FLA coordinator. He was assisted by Bro. Tony Supremido,the Parish BEC Coordinator. The scheduled adult catechism on the Basic Doctrines of the Church (Signs and Symbols) on 7 May, Thursday, was cancelled due to the onslaught of Typhoon Emong which ravaged the province of Pangasinan. The residents had to put extra protective covering to the sacred images at the height of the Typhoon Emong’s fury. Some residents had to sleep in the chapel and kept vigil to safeguard and protect the sacred images from the strong winds of Typhoon Emong. Typhoon Emong also moved the holding of the Youth Encounter a day later. The youth of Bolaoen held their weekend Youth Encounter from 8 May to 10 May, Friday to Saturday. The Youth Encounter was held under the Parish Youth Apostolate Committee under Bro. Marvin Borja, the PYAC Coordinator. The Friday Adult Catechism on the Bible was held after weather had calmed down. Bros. Estephen Espinoza and Randolph Romero, seminarians of the Archdiocese of LIngayen-Dagupan, gave the seminar. On Saturday, 9 May the Visitation ended in Bolaoen. A mass was celebrated at 10:00 in the morning. Fr. Oliver E. Mendoza celebrated the Sacrament of Reconciliation with the residents before the celebration of the Eucharist. The Sacrament of Baptism was received by six children after the Mass. At 1:00 PM of Saturday, 9 May, a procession of the residents was held; the images of the Divine Mercy and the Blessed Virgin Mary were brought from the chapel to the river bank where a bamboo raft, locally called “rocket”, was waiting. The raft brought the images to the foot of the hanging bridge upstream on the other side of the river. The motorcade bringing the images, loaded in a truck, ended in Sition Cosait in Brgy. Inmalog Sur. The residents of Inmalog Sur welcomed the motorcade already at the Mabilao junction and accompanied the truck bringing the images until they reached the chapel of Cosait. A Welcome Liturgy was celebrated. The Visitation in Brgy. Inmalog Sur has begun. It would last for a week. 7 May – San Fabian. The annual “MIsa de Gracia” or Thanksgiving Mass was celebrated by the Parish of St. Fabian, Pope and Martyr, at the Shrine of Our Lady of Manaoag, in Manaoag, Pangasinan. The “Misa de Gracia” was scheduled at *8 o’clock in the morning. Hundreds of parishioners of San Fabian flocked in the church of Manaoag to offer their thanksgiving to God for the many blessings they have received from God for the past year. It was also an opportunity for them to thank Our Lady, the Blessed Virgin Mary of Manaoag, for her motherly intercession and protection offered to the parishioners of San Fabian. Fr. Oliver E. Mendoza, the Parish Priest, with Fr. Abraham Esquig, celebrated the mass. The parish children choir, Angelicum, led the parishioners in singing the songs The members of the Ministry of Altar Server were on hand to serve during the mass. Fr. Oliver E. Mendoza in his homily challenged the parishioners to ask the question,"What would Jesus want ME to do? ", to answer it and act upon it, when faced with a situation that would tend to split their spirit and soul. San Fabian. The Parish Church received a new look. This is more noticeable at night. The facade received an outline of lights which showed the silhouette of the parish church of St. Fabian, Pope and Martyr. Engr. Jesse Tandoc and family provided the much needed support for the project. The lights were first switched on during the Easter Vigil this year. 2 May 2009 – San Fabian. The parish has started its Barangay Formation Program in Barangay Bolaoen. The statue of the Blessed Virgin Mary and the image of the Divine Mercy were brought to Brgy. Bolaoen from the parish church. They were transported by truck. The truck was owned by Bro. Bernie Solis. The images were accompanied by Fr. Oliver E. Mendoza, the parish priest, with Bro. Randolp Romero, a seminarian from San Fabian studying at the Immaculate Conception School of Theology, Vigan City, and some parishioners. They were met by the people of Brgy. Bolaoen at the foot of the hanging bridge connecting Brgy. Bolaoen with Sison, Pangasinan. Since the hanging bridge was not wide enough, the residents of Bolaoen brought the image of the BVM by a bamboo raft, and was brought to the Bolaoen-side just before the mini-dam of the barangay. From there, the people had a procession while singing Marian songs. The people prayed the holy rosary and the chaplet of the Divine Mercy in the chapel. To view more pictures, kindly click here. San Fabian. As part of the preparation for the parish celebration of Christ the King in which the Parish of St. Fabian, Pope and Martyr is the host of the vicariate celebration, the parish is embarking on an extensive Barangay Formation Program. The program is part of the continuing formation of the Basic Ecclesial Communities in the 34 barangays of the parish. The program involves the visitation of the statue of the Blessed Virgin Mary, our Lady of the Most Holy Rosary. The image will stay for one week in the barangay. It is received on a Saturday and w ill be handed over to the next barangay, and received by residents, after a week. While the image is staying in the barangay chapel, it will be processed to the different poruks or sitios of the village. This will be done for about three days, beginning on the Sunday after it is received by the barangay. Three talks will be shared to the barangay: Family and Life (Wednesday), Basic Doctrines (Thursday) and the Bible (Friday). The talks follow the three functions of the Church: as King, Prophet and Priest – a Serving Church, a Teaching Church and a Praying Church. There are four teams of five members who will be facilitating the formation. 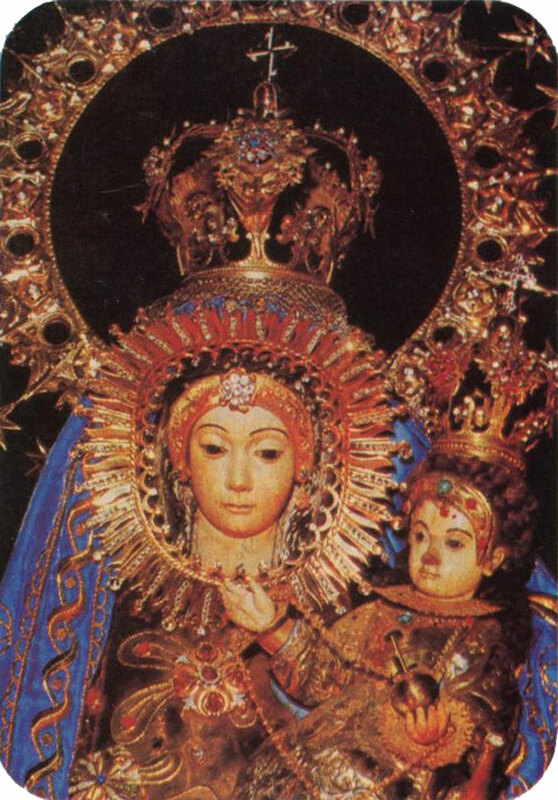 On the Saturday before the image of the Blessed Virgin Mary is handed to the next barangay, a mass will be celebrated. The Sacrament of Matrimony will be celebrated and received by couples who were married civilly. Baptisms will also be celebrated.